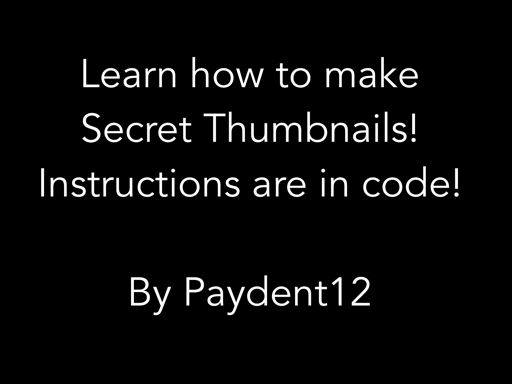 Learn How To Make Secret Thumbnails! “Secret Thumbnail (Instructions in Code! )” by paydent12. Made using the free Hopscotch app! Thanks for reading! Please give me credit if you ever use. Nice tutorial. I usually just do the thumbnail flash like two milliseconds so it's unnoticeable. I've sometimes thought about doing this in my projects, but I always forget to. Also, I knew how to do this before seeing the tutorial, do I still have to give credit to you @Paydent12? I love this idea! I will really consider using this! Awesome! I saw people use this on scratch! Can I use this? I will give credit! Then why are you commenting it on the Hopscotch forums?